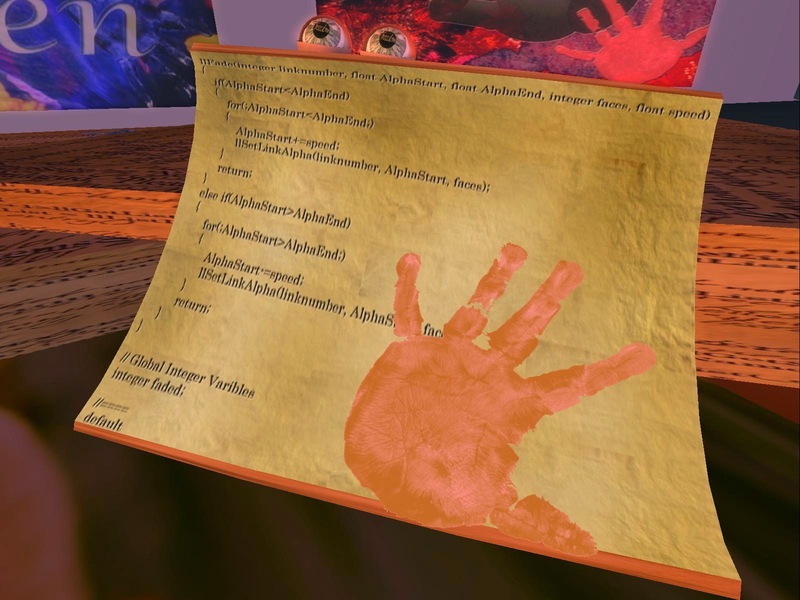 This month, several members of the Virtual Ability community in Second Life® were celebrated for their artistic contribution to The Freedom Project, a 2d/3d art and film exhibit hosted by the University of Western Australia. This unique participatory event is sponsored by the University, Virtual Ability, and the Centre for ME/CFS and Other Invisible Illnesses. Nearly forty artists and film makers from all over the world who self-identify as having a disability or a chronic illness created amazing works of art or films/machinima on the theme of “Freedom,” showing how virtual worlds have in some way helped them or those around them. Their original works reflect profound metaphors and symbols of universal impact, and clearly express the power of virtual worlds for fostering self-growth, deepening understanding, creating community, and helping people go beyond the difficulties and challenges of life. Megadeus’s piece, “Mental Prison,” portrays emerging and hopeful self-awareness, and Ronin1 Shippe shares four colorful abstracts with much symbolism. Roxie Marten’s “Gaze Upon the World” is an interactive 3D work, inviting the viewer to direct participation in experiencing freedom’s impact on life. Slatan Dryke’s “Yonder” is also three dimensional, and seems to draw viewers into dialogue with the core of human essence, revealing hidden ability and talent. In her work “Lotus of Enlightenment,” Tarquin Evermore uses the symbolic lotus flower to integrate and share insights on life, suffering, and beauty. Barbie Alchemi and Fran Serenade touch on similar themes in their collaborative work with Draxtor Despres: a moving film/machinima entitled “We Can Learn & Grow & Heal Together.” Barbie and Fran, as well as Brenda Brodie, join with several other artists in an amazing multi-media collaborative piece “ParkArt Collaborative,” which extends across several inworld locations. Wally (Landscapewallpiece) shares his work “Sky Populus”, a two dimensional collage-based work integrating “the cast-away, the used, and the overlooked” into a powerful, integrating composition with energy and strength. Mathilde Vhargon’s work “Dancing with Impediments” captures movement and feeling. Each of these original works, along with the works of others in the exhibit, connects deeply through image, color, theme and meaning. They will be included in a printed book, published through the University of Western Australia. The book will feature the art from the project. In his book No Man is an Island, poet, philosopher, social activist, and scholar Thomas Merton noted that, “Art enables us to find ourselves and lose ourselves at the same time.” As you explore the rich experience of The Freedom Project, you’ll no doubt agree. You’ll probably find a part of yourself expressed there, in the colors, shapes, words, images, and symbols of these artists’ profound articulations of freedom. To visit the exhibit, teleport to The Freedom Project in Second Life®. Visit The Freedom Project’s website for additional information on this exhibit and the artists and sponsors. Alice Krueger (Gentle Heron) from Virtual Ability, Inc., will also speak on a panel about The Freedom Project exhibit at the upcoming Virtual Worlds Best Practices in Education (VWBPE) conference.